With support, striker, and windcatcher hand crafted from laminated bamboo and coated in clear water-based marine-grade finish. Five or more 25mm diameter chimes cut, tuned, and finished in aluminium, available in standard tunings or to your requirements. Chime set suspended from short chains in galvanized steel links. 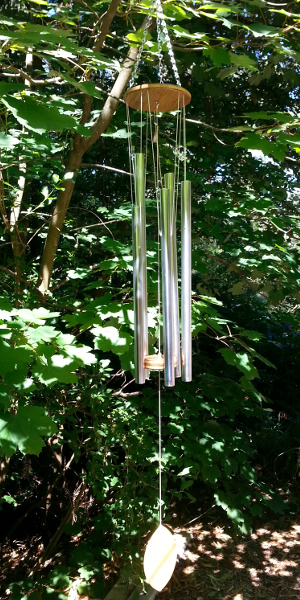 Chimes are strung using multi-ply nylon paracord, with bearing surfaces provided by formed aluminium bushings. teardrop, heart, mandorla, moon, etc.